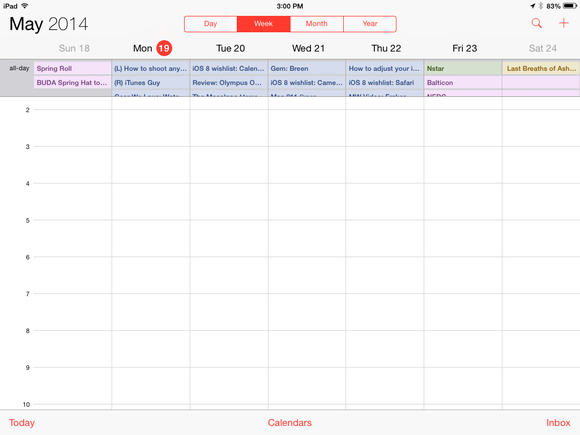 Calendar and Reminders have always been contentious entries in Apple’s stable of built-in apps. In part, that’s a testament to iOS’s robust ecosystem: There are so many great third-party options, appealing to every possible taste, that it’s impossible for Apple’s apps to be everything to everyone. Still, the functions of Calendar and Reminders are so central to how many of us use our iOS devices, that it would go a long way for Apple to improve on its offerings when iOS 8 rolls around, presumably later this year (and, with any luck, announced in just a few short weeks). So as we did with Notification Center and Mail—and will continue to do with other apps over the next couple weeks—we enlisted the help of our Macworld colleagues, and our Twitter followers, to compile a list of improvements we'd like to see in Calendar and Reminders. In Mavericks, OS X's Calendar gained the ability to display a map and the weather of your event's location. Why not iOS? One of the most welcome additions to Calendar in OS X Mavericks was the capability to provide additional contextual information about events. For example, if an event has a location, Calendar can automatically estimate out how long it will take you to get there, and provide a buffer so that you’re warned when you need to leave the house. And to avoid having to fire up a weather app, it Mavericks Calendar can also let you know what the weather at your destination will be like. So why not on iOS? Though we have a surfeit of weather apps on our mobile devices, it would be nice to incorporate that information into Calendar (and, thus, the Today view of Notification Center). And given that Apple’s Maps app originated on iOS—and the fact that our devices frequently travel with us—it would be great to have on-the-fly travel time estimates. And since we’re wishing for better Calendar-Maps integration, Apple could finally make the Location field in Calendar events useful by letting you tap it to get a map of (and directions to) that location, bringing some utility to that plain-text field. Despite the improvements Calendar received in iOS 7.1, a better week view is still on the minds of many of our readers. On the iPhone, the app displays a weekly calendar only when in landscape orientation, and even then the view is limited to a cramped, 5-day view that provides a tiny—and not resizable—pane for all-day events. Even on the iPad's large screen, all-day events are limited to a small window at the top. Sadly, the same is true on the iPad, where there’s even more real estate available: Even when the daily calendar is mostly empty, there’s still no option to expand the area where all-day events are displayed. It’s an issue that makes the calendar far less usable—and it just doesn’t look great, either. OS X's Calendar app has rudimentary natural-language skills, but that doesn't extend to iOS. If there’s one place that Calendar has fallen behind the competition, it’s when it comes to adding new events to your schedule. Apps such as Fantastical have significantly upped the ante with exceptional nautral-language processing—a feature that lets you type in something like “Lunch with Frank and Jane at noon at Lulu’s” instead of having to laboriously fill out a bunch of fields. iOS sort of has this capability thanks to Siri, which can often parse this kind of plain-English statement, and it’s a feature that’s already present in Calendar on OS X. But create a new appointment within the Calendar app on your iPhone or iPad, and the process is nothing but endless tapping from box to box. 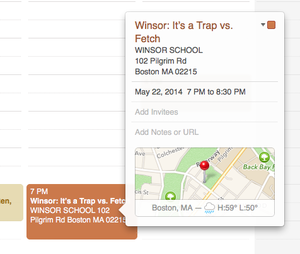 A single text field for quick entry would improve matters greatly. Many of us don’t have wall-to-wall appointments every day of every week, so we’re left with big swaths of blank calendar space. Apple could make more-efficient use of screen real estate by compressing those hours where we don’t have anything scheduled, making it easier to see, at a glance, when our pressing events are. Some calendar apps on the desktop and Web do this already, but it’s even more crucial on a mobile app, where display room is more limited than on a desktop computer. The options for recurring events in both Calendar (pictured) and Reminders could use some bolstering. This one goes out to both Calendar and Reminders: Many of us want more control over how often an event or reminder recurs. 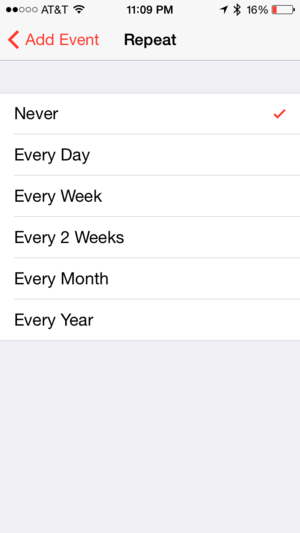 iOS currently offers fairly basic options: Daily, Weekly, Biweekly, Monthly, and Yearly. But what if you want an event that recurs on the third Thursday of every month? Or on Tuesdays and Thursdays? Your best option at present is either to create an event like that on your Mac and have it synced to your iOS devices, or to create more than one recurring event (to use my example, one for Tuesdays and one for Thursdays)—neither of which is a great option. This functionality exists in OS X Calendar, so why shouldn’t it be possible on our iOS devices, too? Speaking of Reminders and missing functionality, one feature continues to be missing in action on iOS: The capability to share reminder lists with others via iCloud. It’s a strange omission, given that the feature is available in both the OS X and iCloud.com versions of Reminders. Sharing Reminders lists is still only possible on OS X and the iCloud Web client, not iOS. Likewise, it would be handy to be able to share not just reminder lists with others, but also individual reminders. That’s not currently possible in any version of Reminders, but if our Twitter feed is any indication, it’s a feature people would like to see in an update to the app. Checkmark (pictured) lets you combine multiple locations as a single group, like "Grocery Stores," for the purpose of location-based reminders. 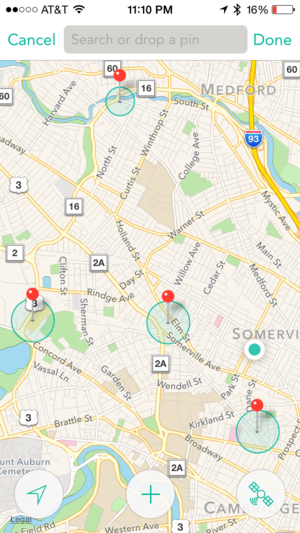 Location-based reminders are a great way to remember to, say, pick up cookies when you’re near the grocery store, but they can remind you only when you’re near a particular grocery store. If, like us, you tend to frequent several supermarkets, you’ve likely wished you could associate such a reminder with multiple locations. Instead, you end up missing out on your favorite baked goods because you pass the “wrong” grocery store on the way home. Certain clever apps, such as Checkmark, have solved this problem by letting you create groups of locations; you can then assign a reminder to an entire group. That way, anytime you happen upon one of the many stores you might frequent, you’ll be reminded to stop in and pick up a tasty treat. Here's hoping iOS 8 gains such a feature. One sentiment expressed by many of our Twitter followers is why these two apps don’t work better together. If you can store your calendar events and your reminders on iCloud, how come you can’t see those reminders on your calendar? That’s especially true in terms of to-do items that have a date and time associated with them. One option might be for the two apps to merge into a single repository for all your events and tasks, though that might be an extreme move that benefits only some while making things more complicated for others—especially those who’d prefer to use other apps for one or the other. Still, it seems as though Apple’s two built-in apps should be on better terms when it comes to talking to one another. 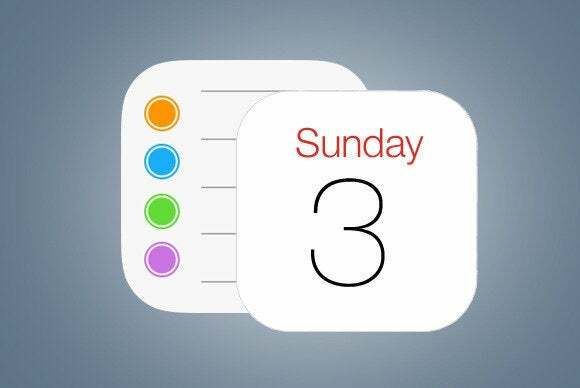 iOS 7 was, of course, a divisive release in terms of its appearance and interface, and even these many months later, plenty of folks still aren’t happy with the visual changes Apple made to its apps, including Calendar and Reminders. We empathize with many of those complaints. Certainly, Calendar needs some work in terms of its views. While Apple has clearly tried to simplify the number of views available, some options (such as viewing a list of all items) are squirreled away in places that even many experienced users have trouble finding. While Reminders has improved, its interface for editing reminders isn’t any better than the respective view for Calendar, requiring you to tap on lots of buttons and fields in order to fill out details. There are a handful of other, smaller, improvements to Calendar and Reminders that we and our readers would like to see. For example, it would be great to get week numbers in the month view, the capability to copy and paste events, options for event templates, tags in Reminders (and maybe even in Calendar while we’re at it). And, of course, reliability is especially important here. Sync has become such an integral part of our daily experiences that the best new features won’t make much of a difference if the infrastructure behind the whole system doesn’t work. As a result, making iCloud syncing (and connections with popular providers such as Google and Microsoft) more robust is at the top of many of our lists, even if it’s not the most eye-catching new feature around. Of course, Apple will always do as it pleases, and it’s just as likely that none of these features will show up in the next update. On the other hand, the company might decide to make these apps one of its tentpole features. We’ll have to stay tuned to find out.